One of the more popular pieces of Barber coinage, the Barber dime is a favorite of today’s coin collectors. In the late 1880s, growing discontentment with the Seated Liberty coinage led the Mint to seek out a new set of designs. Mint Engraver Charles Barber was chosen for the task and created matching designs for the dime, the quarter, and the half dollar. Following years of design issues and production delays, the Barber dime made its debut in 1893. The obverse of the coin has a profile portrait of Miss Liberty with the legend “UNITED STATES OF AMERICA” encircling the rim. The year of mintage is at the bottom. The simple reverse design centers on the denomination “ONE DIME,” which is surrounded by a wreath of corn, wheat, and oak. Both faces have a rim composed of denticles or small bumps, and the edge is reeded. The barber dime is made primarily of silver, with a composition of 90% silver and 10% copper. The diameter measures 17.9 millimeters, and the mass is 2.5 grams. 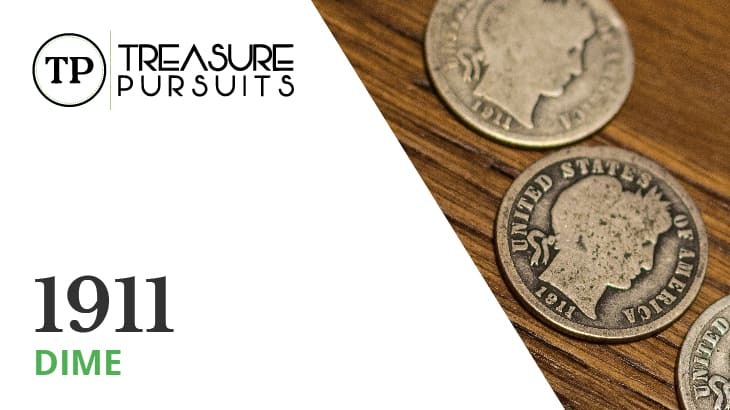 President Theodore Roosevelt famously criticized the artistry of the Barber coinage and voiced his desire for a renaissance of American coinage, and the majority of Barber’s contemporary numismatists viewed the coin as unoriginal and displeasing to the eye. Thus, the coin was replaced in 1916 by Adolph Weinmann’s much more popular Mercury dime. The 1911 mintage of the Barber dime, one of the last issues of the series, was fairly large for the time, coming in at a total of over 33 million coins. Three locations struck the Barber dime in 1911: Philadelphia, Denver, and San Francisco. Philadelphia struck 18,870,000 dimes. This issue is reasonably common in grades through MS-65, and most examples show quality strikes and nice luster, though some suffer from die erosion. Denver was responsible for minting 11,209,000 dimes. As with Philadelphia, these dimes tend to be well-made and can be found with relative ease in grades up to MS-65. San Francisco minted the fewest dimes in 1911: 3,520,000. In spite of this, Mint State specimens, though not as common as in the other issues, are still somewhat available. However, the smaller mintage does typically result in this issue bringing higher premiums than the other two. A repunched mint mark variety is known for San Francisco, but it is considered minor and does not normally increase the value of the coin. When it comes to the buying and selling of coins, especially ones as old as the Barber dime, it is usually best to have them graded by a professional service like PCGS or NGC. However, if you know what to look for, you can get a rough idea of what condition your coin is in. For the Barber dime, one of the most important details for grading is the word “LIBERTY,” found on Liberty’s coronet. Good-4 and lower grade examples will often have the “LIBERTY” inscription completely obliterated, and the overall design will have a worn, flattened look to it. The date and lettering of the legends should still be more or less readable. A Very Good-8 example may have three or so letters of “LIBERTY” visible, though the design will still have a worn appearance overall. All the letters in “LIBERTY” should be visible on Fine-12 examples, though some may still be weak, and the design should be noticeably less worn. Very Fine grades will have clear and plain letters on the inscription. On Extremely Fine specimens, the lettering should be sharp and clear, and finer details like the edges of the headband and the hair should be distinguishable. About Uncirculated coins will have only very slight wear, with almost all the fine details visible. Uncirculated coins show no visible wear, though some markings may be seen. All the design elements show fine detail and distinct lines. As with any coin that contains precious metal, the Barber dime’s minimum value is its melt value. At the time of the writing of this article, its silver content gives this coin an approximate melt value of $1.06, though this will fluctuate with the price of silver. Philadelphia and Denver issues tend to have about the same values. They are worth $3.20 in Good-4, $3.48 in Very Good-8, $4.05 in Fine-12, $7.09 in Very Fine-20, $22 in Extremely Fine-40, $75 in About Uncirculated-50, and $109 in Uncirculated (MS-60). MS-63 examples are valued at $231, and MS-65 examples carry a value of $525. Proof strikes may be worth up to $594. The San Francisco issue commands higher values generally. These coins bring a value of $3.20 in Good-4, $4.05 in Very Good-8, $9.02 in Fine-12, $21 in Very Fine-20, $41 in Extremely Fine-40, and $101 in About Uncirculated-50. Uncirculated (MS-60) grades bring $231, and MS-63 examples are worth $410. MS-65 specimens see a nice price jump to $925.